‘New Londoners’ is the first post in the SUBJECTS series which looks at three projects that uniquely address the relationship between the photographer and the subject. These three approaches use photography, both the process and the result, to address attitudes towards migration and migrants. Each project comes from Europe where this issue is fraught with contention and often framed with firmly held stereotypes. A debate now fought not just on a political level but increasingly in the media and the images it creates. These projects all seek to use the creation of new images as a means to address this increasingly polarized debate. For all these projects the process of making the images, and who is making them, the understanding of the power of photography for both good and for bad, and an understanding of the audience is a conscious and crucial part of the final outcome. New Londoners is a photography project which put cameras in the hands of 15 young people who had moved to the UK as refugees. More commonly the subject of the media rather than its active creators, the young people were provided with the tools to represent themselves. 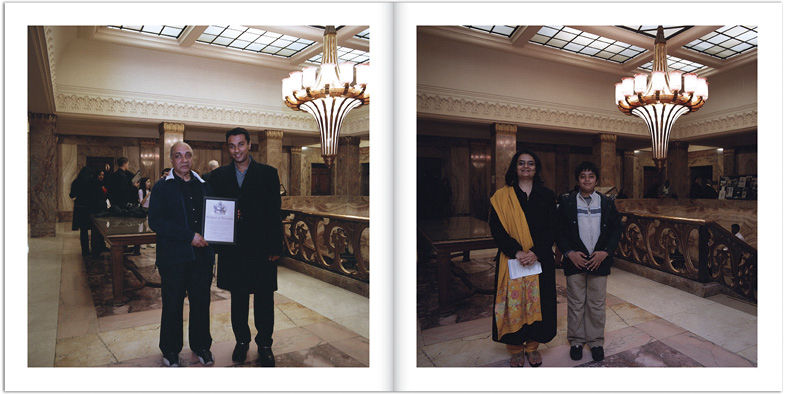 The project was conceived by London based non-profit PhotoVoice and Dost, a centre for young refugees and migrants. A series of images from each young photographer, along with short accompanying texts, were collected for an exhibition and book. 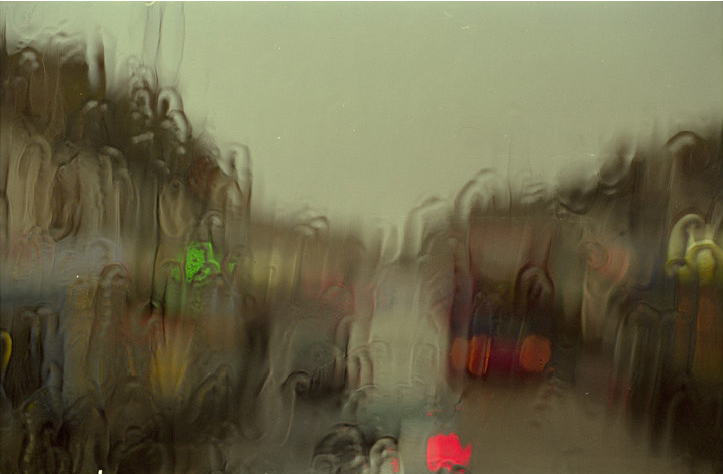 Many of the photographers created conscious photo-stories, connected by an underlying concept, while others documented their experiences more directly. Accompanying image texts: Vaidehi Sita (left) does her weekly shop in Walthamstow market. Janet Macintosh (right) has just moved down from Scotland. She enjoys a summer day out on a boat on the River Thames. She wants this photograph to send to her family in Scotland. As a whole, the project presents a set of varied experiences and voices. Some are critical, some reflective, others positive and hopeful. Many of the images are powerful because they present such normal, almost unremarkable scenes of London that many residents could relate to. Their selection makes us view these through fresh eyes with the brief but powerful accompanying texts further clarifying the photographer’s intentions. 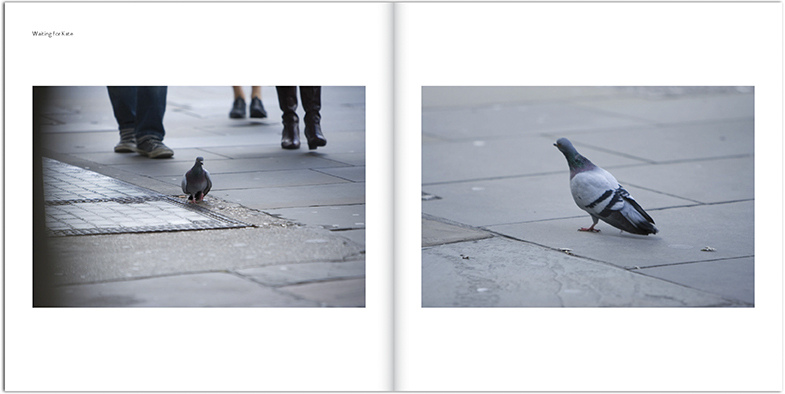 …I like London because there are many different types of people from all over the world living together. Everyone is equal but different. In my country everyone is the same, we are all Muslim, but we are all fighting. I love my city. But I want to live in London and be equal, when I get the visa… The photos I have taken were put together to show how my thoughts are. Always in twos, for every happy thought, an unhappy thought. For every time I think of being here, I think of there. Wanting to be here, but missing there. Not being a part of here, but also beginning to be. 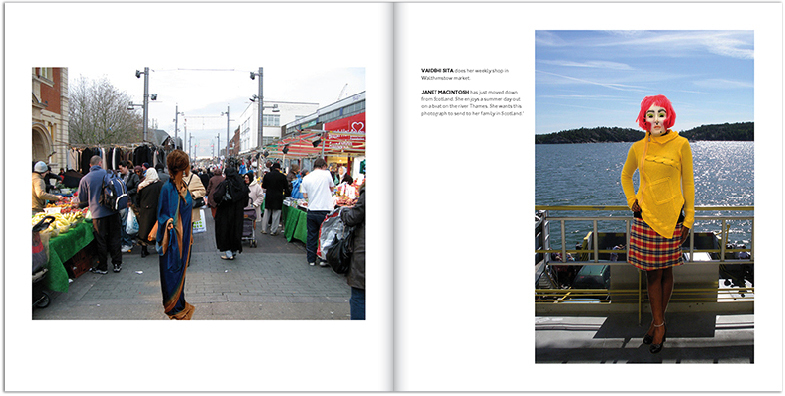 Other images draw on positive aspects of the city, things that many local residents might feel proud of. 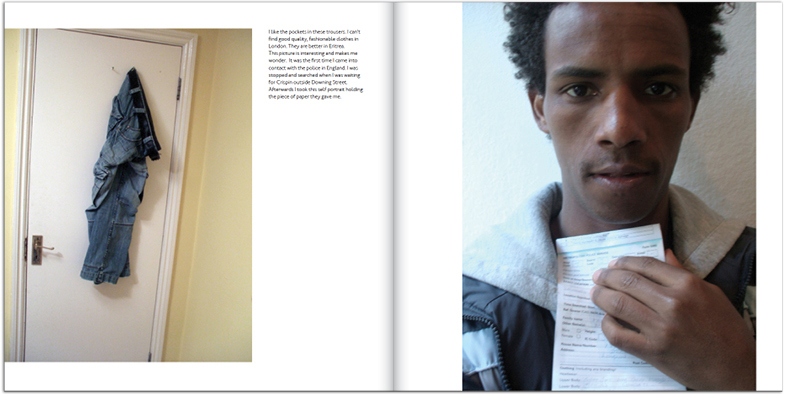 London’s multiculturalism, for example, is a common thread between many of the series, while in others this is contrasted by a day-to-day reality, where the photographer’s ‘otherness’ is in sharp focus, and their images and comments speak directly to the viewer about the way in which they are treated as an ‘outsider’. Image text: Right: This picture is interesting and makes me wonder. It was the first time I came into contact with the police in England. I was stopped and searched when I was waiting for Crispin [his mentor] outside Downing Street. Afterwards I took this selfportrait holding the piece of paper they gave me. The choice of the book format as the vehicle for these messages was a carefully planned part of the project. A key audience for the project was UK policy makers, notoriously busy and sent numerous reports. Unlike a report the ‘art book’ was something they would be reluctant to throw away. 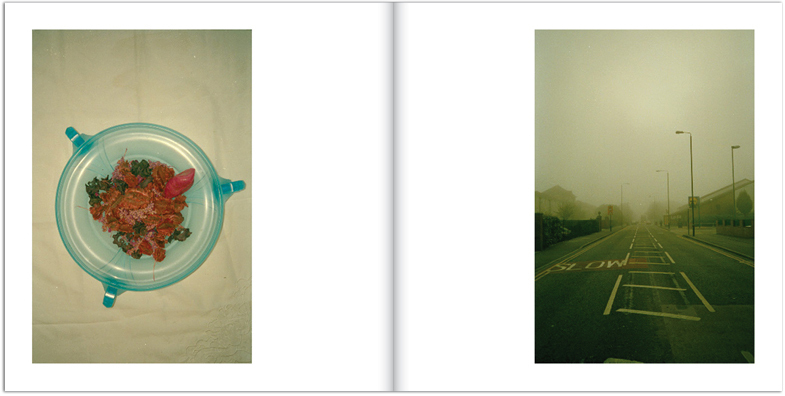 The book also offered a guided, slow and intimate viewing of photography, unlike an exhibition or webpage. As an art book it could also be used to reframe the debate, drawing it away from the heavy rhetoric of immigration politics. The status of the book, as a mark of value, lent weight to the images, raising the profile of the work from amatuer photgraphy to an object which could be reviewed and therefore publicised through cultural channels rather than political ones. Using the frame of London meant the book often ended up in the London section of a bookstore, and therefore was more likely to reach the general public than activists or academics already engaged in the debate. Supporting text: I had my citizenship ceremony last summer and to my surprise it was quite emotional. The Town Hall provides a lovely service and makes sure citizens are made to feel welcome and appreciated. It feels like a very positive symbol of ‘real’ multiculturalism. This project is powerful not simply because the camera was in the hands of young refugees, but because they were given the support to make images that would find an audience and resonate with them. 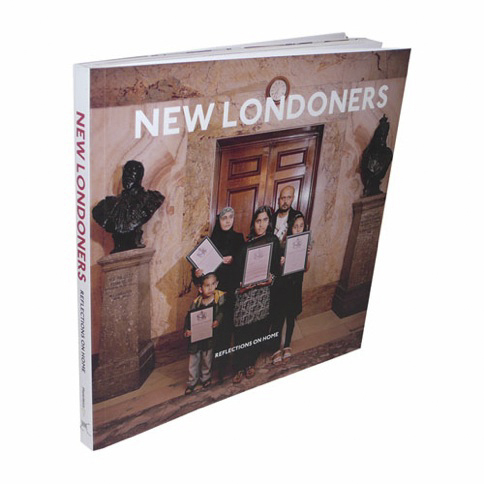 New Londoners is an example of how a photographic project, by carefully considering process, audience, format and even distribution, can design for more focussed and meaningful impact. With thanks to Tiffany Fairey for her reflections on the project. Book image courtesy of Trolley Books, London.